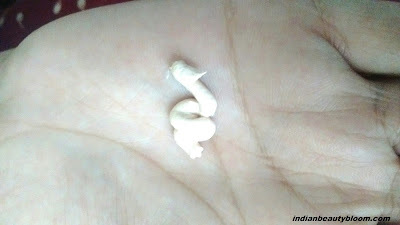 Today I am going to review one more product from brand Ethicare Remedies . 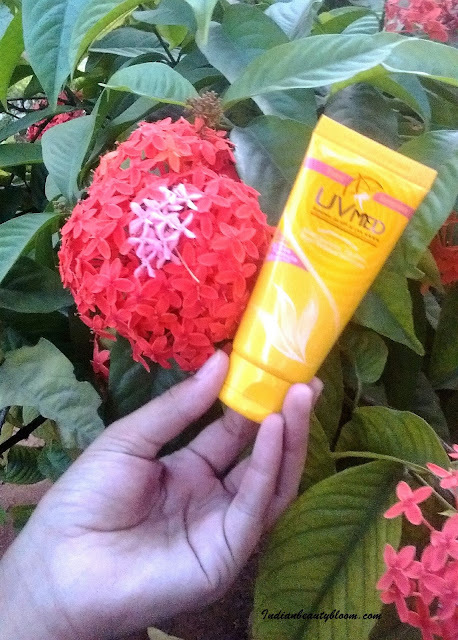 It’s UVMed Tinted Sunscreen Gel Review . Ethicare Remedies is a Pharmaceutical Company and they have wide range of products for Skin Care , Hair Care , Lip Care for all seasons . I have already tried & reviewed some of their products ,all were good this one is also good. 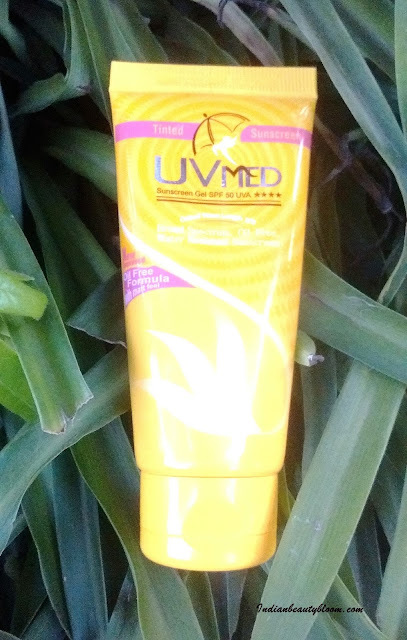 This UVMed Tinted Sunscreen Gel is an excellent product in their Summer Care range . It’s an Oil free formula which protects the skin from harmful UV rays . An ideal product for Indian Summers . The sunscreen comes in a Yellow color tube which is travel friendly . One can easily squeeze out little amount of product from the tube without any wastage of it . 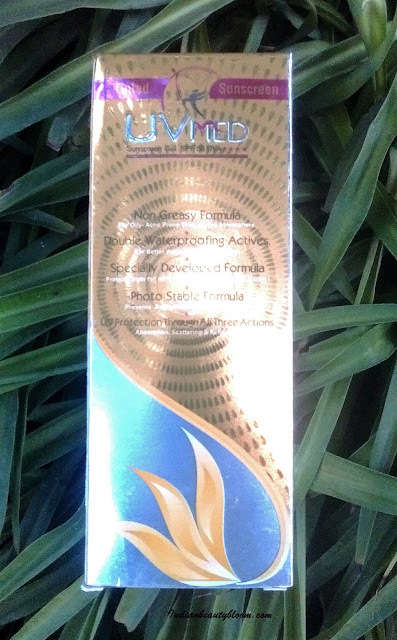 Outer packaging consist of a cardboard with all product information given on it . Shelf Life : 2 years . Ingredient List is Long . Nano Sized Zinc Oxide and Titanium Dioxide . 1.A broad spectrum Oil free formula . 2. Water resistant sunscreen . 4. Free of artificial color & fragrance . 5. Travel Friendly pack . 8.Suitable for all skin type . Availability might be an issue as available only on online stores and their official website . The product claims to protect the skin from harmful sun rays . To prevent darkening of skin , sun burn and premature ageing . Suitable for all skin type even acne prone Oily skin . One needs to apply this evenly on face , neck and all exposed areas 20 minutes before going out in sun . For swimming one needs to reapply this after few hours . Should not be used for kids below 6 months of age . Though the product says its a sunscreen gel but it does not looks or feels like a gel , it’s like a BB or CC cream , something similar to VLCC sunscreen cream . Texture is neither too thick nor too runny . It gets absorbed in the skin easily and gives a Matte Look . 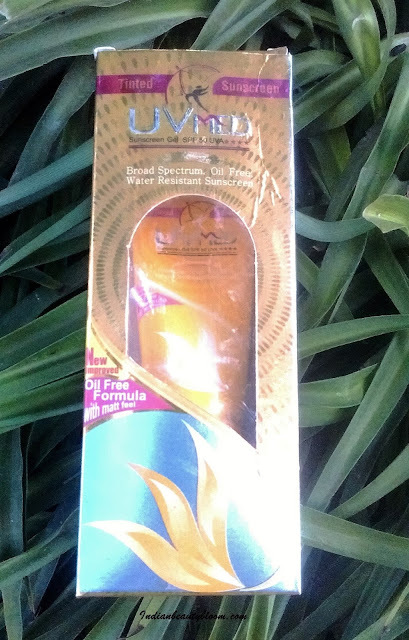 Gives good protection from harmful sun rays and Since its SPF value is 50 , it’s too good , specially for Indian summer , One can also use this while Swimming . Price is bit higher than sunscreen creams & lotions from other brands but it’s Okay since its a good product with High SPF . Overall I am impressed with this product .